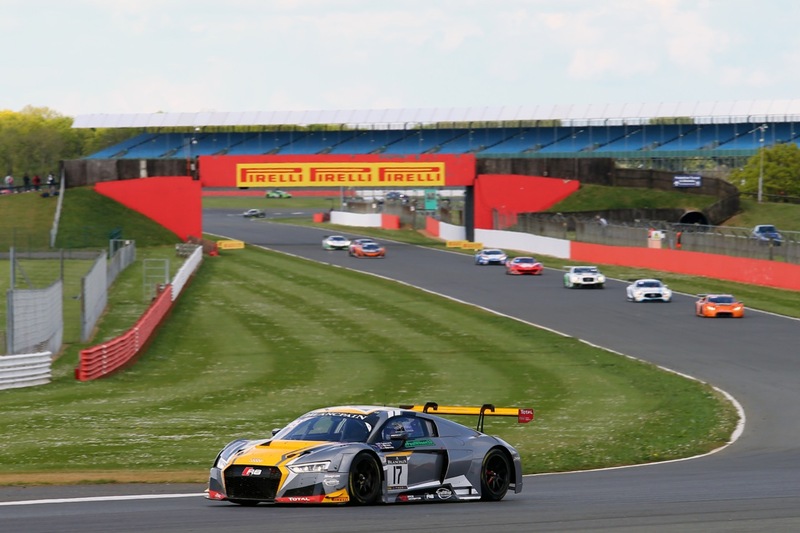 Jake Dennis succumbed to a lack of power from his Audi R8 LMS which prevented him from hanging on to a points-scoring finish in the fourth round of the Blancpain GT Series, three-hour Endurance Cup encounter at Silverstone. The Racing Steps Foundation-backed driver, who along with his #17 Team WRT team-mates Stuart Leonard and Jamie Green, was forced to start the race from 29th position on the grid with their car struggling for grunt and straight-line speed. It was a similar story for fellow RSF-backed racer Ben Barnicoat who along with team-mates Rob Bell and Côme Ledogar, was hindered by the series’ Balance of Performance rules and extra ballast which curtailed the Strakka Racing-run #58 McLaren 650 S GT3 performance to a 26th place start on the grid. After a sedate start to the race, in which neither the #17 Audi, nor the #58 McLaren moved dramatically from their qualifying positions, Green’s Audi benefitted from some quick thinking from the Team WRT crew. With 50 minutes of racing complete, the #44 Strakka McLaren piloted by Jonny Kane suffered a heavy collision with the Armco barrier at Turn 3, prompting a Full Course Yellow. With Green at Brooklands when the incident occurred, he was immediately called into the pits for the first of three scheduled driver changes, new tyres and fuel. When team-mate Stuart Leonard took control and exited the pit lane, the Full Course Yellow was changed to a full safety car intermission, prompting the rest of the field to then pit for their driver changes. As Leonard moved ahead of those cars in the pits, the safety car also slowed the pack down, enabling Leonard to catch up on to the rear of his rivals ahead and move into a resulting seventh place. The #58 Strakka McLaren was not as fortunate as was one of those cars to pit during the safety car period, with Barnicoat taking to the wheel for the second stint and returning to the circuit in 34th place. Worse was to come for Banicoat, however, as once the race restarted after 15 minutes he was soon hit into a spin by the #55 Spirit of Race Ferrari 488 GT3 machine of Giancarlo Fisichella, which was later handed a drive-through penalty for the offence. The contact broke half of the McLaren’s rear diffuser and compromising the car’s downforce. With Dennis taking over from Leonard for the third and final stint in the #17 Audi, he returned to the track in ninth position, but with an engine down on power and struggling to defend the position for the final hour of the race. Barnicoat eventually handed over to team-mate Côme Ledogar in 24th position, who equally struggled to make vast in-roads through the field following the car’s damage. Having mounted a sturdy defence of his ninth position, Dennis eventually succumbed, firstly to the #7 Bentley Continental of Steven Kane, and then the#14 Jaguar of Albert Costa. On the penultimate lap, Dennis’s misery was compounded by losing a further two places and taking the chequered flag in 13th position but claiming the title of top-placed Audi. "It's disappointing to miss out on the top 10 and any points, but I felt quite out of position with the lack of power and having to defend as hard as possible from the cars trying to get past," Dennis said. "Our power disadvantage made it extremely difficult this weekend as a whole, but we'll look to rectify it for the next round. I'm happy for us to be the top-placed Audi though, that's something positive that we can take away from the weekend." On the final lap, Ledogar and the #58 McLaren’s terrible day was complete, as he was forced to stop at the side of the track following an oil pump failure, classifying the car in 34th place. "That was just a weekend to forget about," Barnicoat admitted. "Once I had been hit after the safety car period had ended, the car's performance was really affected. The oil pump letting go on the final lap just summed it up. We're struggling with the Balance of Performance ballast really hindering us. But we need to bounce back and look to improve the car for the next round." The #63 Grasser Racing-run Lamborghini Huracan GT3 of Andrea Caldarelli/Christian Engelhart/Mirko Bortolotti took a second win in as many weekends with victory, narrowly ahead of the #84 Team HTP Mercedes-AMG GT3 of Jimmy Eriksson/Maxi Buhk/Franck Perera. The final step of the podium was completed by the #90 Akka ASP Mercedes-AMG GT3 trio of Michael Meadows/Edoardo Mortaro/Raffaele Marciello.